(AP) -- Investors have panned his shake-up strategy and employees are rankled. Now, Nokia Corp.'s Stephen Elop, the first non-Finn to lead the world's largest maker of phones, is in a hurry to justify his decision to ditch the company's smart-phone software in favor of a former employer's, Microsoft. He has a lot of ground to cover. Nokia's stock, which lost 14 percent after the Microsoft deal was announced Friday, fell a further 4 percent in midday European trading Monday and about the same in the U.S. when the market opened. Nokia employees are showing their displeasure with their feet, walking out from work en masse on Friday. Elop presented his case, to both investors and employees, at the world's largest cell-phone trade show, which opened Monday in Barcelona, Spain. 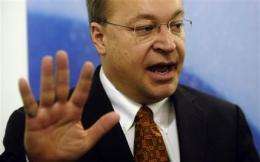 Elop, who is Canadian, then addressed changes for employees during an interview with The Associated Press. "Every employee goes through an emotional journey, and the emotional journey is difficult, because this is such a big change," he said. "I've had four and a half months to go through my emotional journey, ending up in a very different position from what I had assumed when I first joined." Nokia has been losing market share to Apple Inc. and others that have moved aggressively into the smart phone market. The company's worldwide market share in smart phones was just over 30 percent in the fourth quarter, down from 40 percent a year earlier. It's still the biggest maker of non-smart phones, but everyone in the industry believes smart phones are the future. The shift has been so drastic that Elop, in a memo leaked last week, compared the company to a burning oil platform, asking employees to jump off of it with him in search of a safer place. The memo had industry analysts talking. "Nokia has jumped into the icy water from the burning platform, but we are not sure when the lifeboat is going to turn up, and the water appears to be infested with predators," said analyst Richard Windsor of Nomura Securities. Microsoft Corp. launched a new phone operating system, Windows Phone 7, late last year. Reviewers hailed it as big improvement over previous attempts, but so far it hasn't made a dent in the dominance of Google Inc.'s Android software and Apple Inc.'s iPhone. Windsor expects Android to snap up the market share that Nokia might lose while it phases out Symbian. Nokia has said it might start selling a Windows phone this year, but it isn't promising anything. One competitor, Sony Ericsson CEO Bert Nordberg, said that he was "very happy" that Nokia chose Microsoft rather than Android. Sony Ericsson ditched Symbian last year in favor of Android, and the strategy has met with modest success. If Nokia had entered the same space, it would have created enormous competition and pricing pressure. On Sunday, Nordberg announced that Verizon Wireless would carry a Sony Ericsson phone for the first time in years. Elop said that he and other Nokia executives felt that adding Nokia's production capacity to an already crowded field of Android phones would have forced prices down too sharply. "We also believe firmly that creating a three-horse race was also in the best interest of consumers: It gives them more choice," Elop told the AP. Nokia also had more to give Microsoft, Elop said. Its location and mapping services complement Microsoft's Web search services. Microsoft had more to gain from Nokia's support than Google, which already has broad backing for Android, and that meant it was willing to pay Nokia billions to switch. Even a three-horse race might be tough for wireless carriers to swallow, Sony Ericsson's Nordberg said. Wireless carriers have seen their power over the phones they sell, and thus the ability to benefit from software loaded on them, eroded ever since Apple launched the iPhone in 2007. Though he likes Android, Nordberg is on the lookout for a second platform that phone companies might like, as a balance to dominance by the Big Three. Shares of Nokia fell 42 cents to $8.94 in morning trading.